Ruth was full of old wives tales, and age old advice. She told me to leave my parsnips in the ground until spring. I was quite certain that if I followed that advice they would rot. Well last fall at 8 months pregnant the garden lay forgotten. Thus the parsnips sat in the ground all winter. Today was a balmy plus 5, and so baby and I ventured out to begin cleaning up the garden beds. 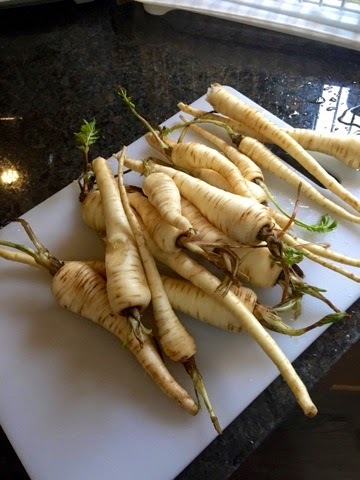 Here's what we found - lovely sweet parsnips! It seems Ruth was right.